Posted on April 9, 2012 by Becki M.
What a week! 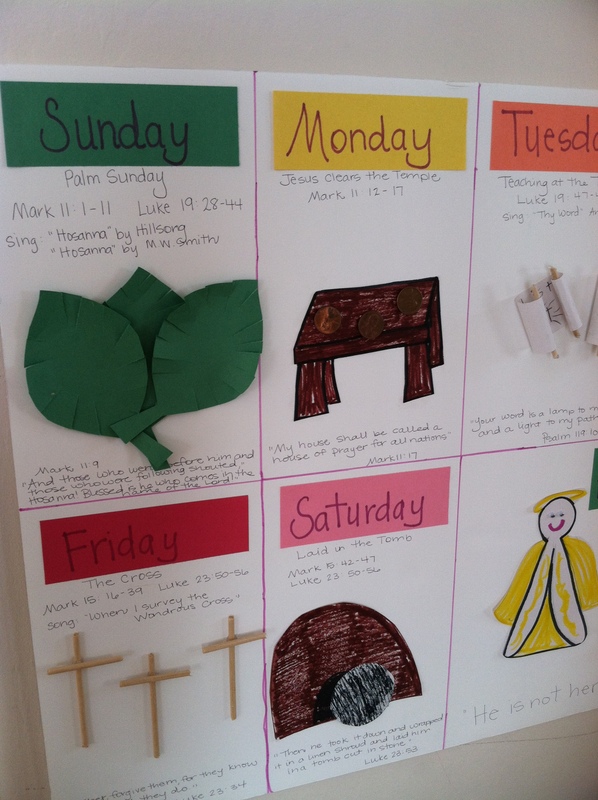 When you believe that Jesus Christ is the living Son of God, and want to impress these truths upon your children, the week before Easter is a busy one. Praise the Lord above that their salvation is not based up my works, but on His grace, but the thought of eternity for your children is a heavy yoke to bear. My constant prayers and never-ending character building means nothing if I don’t take the time to teach. To impress the truth on their hearts. I can not wait for a youth pastor in 10 years to do it, or a Sunday school teacher once a week to do it; it all begins at home, and it all begins now. Yesterday, actually. Or really, 6 years ago when my first child entered this fallen world. 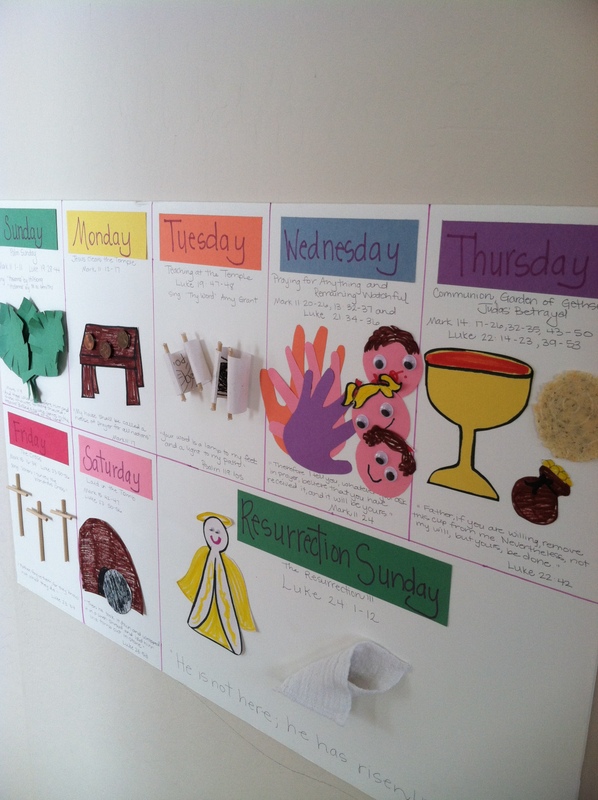 I found an amazing, interactive Holy Week calendar on Pinterest a few months ago that a Christian homeschooling Mama called The Domestic Notebook had posted. I pinned it, and luckily had come across it again a few weeks ago. I got everything together, which took about an hour on my part, and had everything ready to go starting the Sunday before Easter, otherwise known as Palm Sunday. The kids LOVED it! Most of the symbols I made ahead of time, and then they glued them onto our calendar after we studied the scripture and talked about the story. Some of the crafts they made themselves, like the palm leaves, their “watchful eyes” faces, and their praying hands. You will have to forgive my artwork, lol! This was an amazing way to make the events that happened almost 2,000 years ago come alive and real for my children. Jackson asked to do it again next year, so I am going to work on a more permanent version that we can use again and again. I am also going to change some things up on our permanent calendar, and add newer songs and maybe symbolic snacks to go along with our stories. Thank goodness I have a whole year to work on it! For the complete list of symbols, scripture, and the original post of this great idea, check out the Domestic Notebook. She no longer blogs anymore, but she has some terrific things in her archives! Posted in Homeschooling, My DIY Projects. Bookmark the permalink.